Chief Minister Virbhadra Singh today inaugurated an astroturf hockey stadium at Una. It is the second astroturf stadium in the state. This first astroturf hockey stadium was set up at Shilaru in Shimla district. Members of the District Hockey Association, including general secretary Paramjit Singh and Kushal Singh and the Director, Sports, welcomed the Chief Minister on the occasion. Members of the Kushal Singh Renny and Paramjeet Singh Lucky Hockey Association pose with Chief Minister Virbhadra Singh at Una on Sunday. The 50-km Mehatpur-Amb express highway in Una district is ending almost in a mess, with its width being reduced at many places and many technical specifications being relaxed. The work on the 120-km Mandi-Manali stretch that will be upgraded into an express highway will be carried out in two parts and the road will be four-laned only up to Kullu. After three days of heavy snowfall in the higher reaches of Manali and rain in lower parts, residents and tourists got some relief from biting cold today. The Rohtang Pass has also been thrown open for vehicular traffic. The Seli Project Sangharsh Samiti (SPSS), Udaipur, has accused the Seli Power Project of luring villages by illegal means to get a no-objection certificate (NOC) of the gram sabha and panchayat, Udaipur, for the controversial 400-MW Seli power project on the Chenab. Tribal people objected to the project because the 81-metre-high dam will destroy 57,219 plants and trees in the area. Leading global consultant Grant Thornton, in its report, has stressed the need to set up a tomato processing plant here. It will provide remunerative returns to tomato growers of Solan. The joint platform of mass organisations of various CPM outfits will hold a rally here on November 12 to create awareness among the people about the “neo-liberal” policies of the UPA and the NDA governments “responsible for the rising unemployment, corruption and economic slowdown”. Kuldeep Tanwar, president, Himachal Kisan Sabha, addresses mediapersons in Shimla on Sunday. The government is preparing a five-year action plan to help increase the net irrigated area to 50 per cent of the net sown area to improve farm productivity and in turn enhance livelihood of farmers. The State Medical Officer’s Association has urged the Chief Minister to order and an inquiry into the posting of freshly appointed BDS doctors as National Rural Health Mission (NRHM) consultants by ignoring senior medical officers having administrative and clinical experience. The presence of mining mafia in the industrial hub of Baddi-Barotiwala-Nalagarh (BBN) is now creating trouble for the police. More than six persons pushed the policemen and managed to drive away their vehicles when a police team tried to stop three trucks carrying illegal quarry material at Nalagarh last night. Members of the state Indian Ex-servicemen Movement (IESM) today demanded the reconstitution of the state and district-level sainik welfare boards, saying that the “the successive state governments are not serious about the welfare of serving and retired soldiers, war widows and their families”. After the dissolution of the Hamirpur Block Congress Committee (BCC) by the Himachal Pradesh Congress Committee (HPCC), the HPCC has started the process for the formation of a new BCC. The Wildlife wing of the Forest Department has set up a first bird ringing station in the Western Himalayas at Sairopa (Kullu) in the Great Himalayan National Park (GHNP) with the help of British experts. A month-long free self-defence karate camp for girls organised by the Academy of Martial Arts, Sundernagar, concluded at Mahadev village, near here, today. Lal Singh Sen, Principal, Government Senior Secondary School, Mahadev, said around 50 girls of the school received basic training in karate and they attended 15 sessions of training. Health Minister Kaul Singh Thakur has asked all the medical officers posted in state hospitals to prescribe only generic drugs to patients visiting government hospitals. The Health Minister has taken a serious note of a number of complaints alleging that doctors are prescribing only those drugs where drug manufacturers have been paying incentives and commission to doctors. Hamirpur, November 10 Two cases of sexual assault have been reported in Hamirpur district. In a case registered under Badsar police station, a minor was allegedly raped by her minor cousin. As per police information, the victim had gone to bring back her younger brother who was watching a TV programme at her cousin's house and was allegedly sexually assaulted by her minor cousin there on October 20. The BJP Mahila Morcha, Ghumarwin, has decided to work hard to ensure the victory of BJP candidates in the next Parliamentary election and support party’s Prime Ministerial candidate Narendra Modi. The National Thermal Power Corporation (NTPC), which is constructing the Kol Dam project, allotted 43 plots to families of villagers who have been uprooted from their ancestral homes here yesterday. The Umang Foundation, a public welfare trust, organised a voluntary blood donation camp on the Ridge here today in which 95 persons donated blood. Yashwant Rai, general secretary of the foundation, said the camp was inaugurated by Madhu Sudan, who had donated blood 105 times. Four persons, including the driver of a vehicle, were seriously injured when their pick-up swerved off the road and rolled down near Gait on the Chamba-Khajjiar road this morning, an official report received here said. 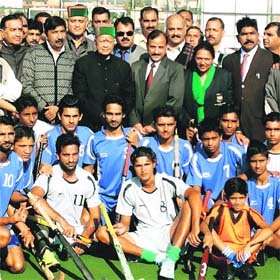 Chief Minister Virbhadra Singh today inaugurated an astroturf hockey stadium at Una. It is the second astroturf stadium in the state. This first astroturf hockey stadium was set up at Shilaru in Shimla district. Members of the District Hockey Association, including general secretary Paramjit Singh and Kushal Singh and the Director, Sports, welcomed the Chief Minister on the occasion. Una district of Himachal Pradesh has produced two Olympian international hockey players, including Chanranjit Singh and Deepak Thakur. An international-level astroturf hockey stadium will help in grooming hockey players from the area. The astroturf stadium at Una has been brought up at a cost of about Rs 4 crore by the state Sports and Youth Welfare Department. It is as per the norms fixed by the International Federation for Hockey (IFH). Sources available at the spot said the stadium was now fit for even international matches as per the norms of the IFH. However, the sources said, the maintenance of this stadium would be a problem. The Sports and Youth Welfare Department was a government agency for maintaining the stadium. The sources, who spoke on the condition of anonymity, said though the stadium had been brought under the aegis of the Union Government, the state sports department did not have funds for its maintenance. The astroturf stadium required regular maintenance for which funds would have to be arranged by the department. Improper use of the stadium could cause damage to the astroturf. The players would have to be provided special hockey sticks, balls and shoes to practise on the astroturf stadium. After inaugurating the Sombhadra festival late last evening, the Chief Minister said a balanced and uniform development of the state was the prime objective of the present state government and every effort was being made to make Una a model of development. Virbhadra Singh said the credit for making Una a separate district went to YS Parmar, first Chief Minister of the state, and since then Una had made rapid strides on all developmental fronts. He said, "Fairs and festivals showcase our vivid cultural heritage and help in strengthening the unity and integrity of the country. Our government is giving added priority for the conservation of unique cultural heritage and customs of Himachal Pradesh." The Chief Minister said the Sombhadra Mahotasav was the main festival of Una district and people from neighbouring states also actively participated in it. He said exhibitions set up by various government departments, boards, corporations and NGOs during the festival made people aware of welfare policies and programmes of the state government. Virbhadra also released a souvenir of the Sombhadra Mahotasav on the occasion. Mukesh Agnihotri, Industries and Information and Public Relations Minister, Kuldeep Kumar, Chairman, 4th Finance Commission and MLA, Abhishek Jain, Deputy Commissioner, Una, and Anupum Sharma, SP, Una, and senior officers were present on the occasion. The highway was funded by the World Bank and as per the project report was to be a express highway. The work for the construction of the express highway was awarded to Longjian, a Chinese company. The road was to be completed by 2010, but even at the end of 2013, it is nowhere near completion. Sources here said the Chinese company had been asked to complete the tarring of road by April 2014. However, the company might not be in a position to complete even tarring as at many places, the state government had not allowed it to remove the encroachments for facilitating the tarring work. Roads near the bridges cannot be constructed as work on bridges has not started. No decision has been made about the 32 bridges that were to be constructed on the rivulets falling in the express highway. During the stint of previous BJP government, the work for the construction of bridges was outsourced to a local company. The company left the job incomplete. The state government is yet to decide on handing over the construction of bridges back to Longjian or further outsource it to some other company. The sources said even if the work is handed over to Longjian or any other company, the construction of bridges would extend the completion of road project till 2016. The sources said that as per the project report, the width of the road was to be 21 feet. At many places, it has been reduced to 18 feet as the government has not ordered clearing of encroachments by influential people. In the original detailed project report, there was a provision of construction of bus lay-byes along the road for parking buses for boarding of passengers. The sources said the state government has not acquired land for bus lay-byes and idea of their construction had been dropped. As per the rules of PWD, no construction can come up within 25 feet of the edges of the express highway. New constructions are coming up right on the edge of the road, leaving no space for parking. At places, the road has been given the curve to save a small temple. The real sufferers due to non-completion of the road project are commuters and locals. In the recent past, three youths lost their lives in an accident on the road. About 100 people have lost their lives due to accidents on the road since work started. Most accidents were caused due to poor condition of the road. The decision to implement the project in two parts has been taken keeping in view the fact that there are already two parallel roads beyond Kullu running along the Beas and as such four-laning was not required. The improvement of the double lane of the main highway on the right bank of the Beas is enough as the volume of traffic is also less to justify a four lane. Further the left bank road could be improved. "An added advantage will be that the four-laning project up to Kullu will not require any environment clearance. The Union Ministry of Environment and Forests has exempted road projects up to 100 km involving additional right of land acquisition up to 40 metres on existing alignments and 60 metres on re-alignments or bypasses falling within the altitude of 1000 metres," says Satish Kaul, project director, National Highway Authority of India. However, the environment clearance will be required for the 38-km Ram Shila-Manali project as the areas beyond the elevation of 1000 m have been categorised as eco-sensitive. The four-laning from Ner Chowk to Ram Shila will involve the construction of seven tunnels aggregating about 9 km in length. 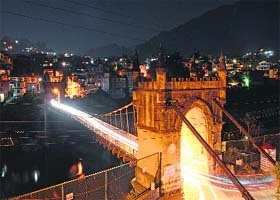 The congested Mandi town will be bypassed by taking the existing road from the left to the right bank of Saketi Khud. The bypass will take off from Saketi Bridge involve the construction of two tunnels and rejoin the highway near the forest barrier. It will also help reduce the distance by about 6 km. The rest of the tunnels will be constructed along the existing highway to facilitate widening in precipitous rocky terrain where the road runs close to the river. With all clearances granted and the required process for land acquisition completed, work on the 84.38-km Kiratpur and Ner Chowk four-laning project will commence soon. The total cost of the project is estimated at Rs 2,356.20 crore. Sources said dozens of vehicles carrying passengers and other essential commodities crossed the pass. Residents of Lahaul, who had been trapped in Kullu after blockade of the Manali-Keylong road in the wake of heavy snowfall, too, left for their destination. Randhir Singh Salhuria, Director, Atal Bihari Vajpayee Institute of Mountaineering and Allied Sports (ABVIMAS), said two rescue posts would be set up on either side of the Rohtang Pass on November 15. He said keeping in view the safety of pedestrians, two posts would be set up in Marhi below the Rohtang Pass and Koksar in Lahaul district. Both posts would monitor all pedestrians crossing the Rohtang Pass. Salhuria said it would be necessary for pedestrians to get themselves registered with the posts before and after crossing the Rohtang. 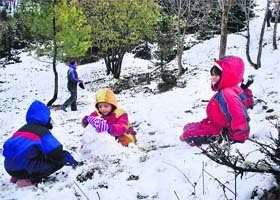 Hundreds of tourists thronged Manali to see fresh snow which had become an attraction. Local hoteliers, taxi operators and people engaged in tourism business were happy as snow was proving to be a boon for the tourism industry. 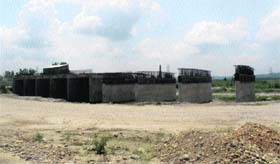 Though the company told the villagers that they were distributing chickens among the villagers as a part of its corporate responsibility, convener, SPSS, Sudershan Thakur alleged that the company had resorted to illegal means to lure the villagers to get the NOC for the project, which would be disastrous for the region. The company had given 20 chickens to each family in Udaipur, Ratoli, Salpat, Kuraki and other villagers, said members of the SPSS. Gram Pradhan, Udaipur, Shamsher said the panchayat and sabha had not given an NOC to the company. “We have asked the company to lower the height of the dam to minimise the damage to the area and trees”, he asserted. The project being executed by SPPL, a sister concern of Moser Baer, faces a tough task for obtaining the NOC as Forest Minister Thakur Singh Bharmouri had shot off a letter to Union Forest Minister Jayanti Natrajan registering his objection to the project which would destroy two lakh trees and saplings. Besides, he also blamed the previous BJP government of PK Dhumal for allowing the project despite objections by local tribal people. SDM, Udaipur, RK Thakur said nobody had brought the complaint to his notice. The company has sought to divert 276 sq m of the forest area for all works, including dam, muck dumping sites, the surge shaft and roads, but it has yet to pay Rs 100 crore for its diversion to the government, said forest officials. The MOEF has not given its final approval to the project, said DFO Lahaul forest division. SK Khare, Head, hydro projects of the company, said the company had proposed to build a concrete wall along the river to minimise the submergence of trees and land in the dam. The firm has prepared a report to assess the requirements of the horticulture sector following the approval of a Rs 4 crore project on the National Mission on Food Processing for the state. The Union Ministry of Food Processing will provide 75 per cent funds for this project while the remaining 25 per cent will be pooled in by the state. The report has assessed that most of the tomato growers are small and marginal farmers and there is need for value-added processing in the state so as to give remunerative returns to the growers. This can help maintain consistent productivity of this crop. Tomato covers 13 per cent of the total area under vegetable cultivation and it is 26 per cent of the total vegetable production. In 2012, the total area under tomato production was 9,870 hectares and Solan district produces the bulk of tomatoes and is often called the "tomato bowl" of the hill state. According to studies carried on tomato by Grant Thornton, it has been noted that apart from use in vegetables, its products such as soup, concentrates, sauce, puree, ketchup are also popular and they have a longer shelf life unlike fresh tomatoes. Tomato is perishable and needs to be transported carefully to avoid damage during transit. Tomatoes produced in Himachal have a huge demand in the rest of India due to good quality and taste. The per capita consumption of processed tomato products in Himachal Pradesh is 12.11kg/per capita/per annum. The consultant has suggested the use of newer mode of packaging products such as multilayer flexible plastic packaging, tetra pack and brick packing as this allows tomato products to remote areas and store these at room temperature for more than four months. Solan has a high production level of 1,80,000 MT and low cost of land compared to other districts, besides good connectivity with other districts such as Bilaspur, Shimla, Sirmaur, etc. The announcement for the rally was made at a joint press conference addressed by Kuldeep Tanwar, president of the Himachal Kisan Sabha. Representatives of various left organisations, including the Centre of Indian Trade Unions, Democratic Youth Federation of India and Students Federation of India, were also present. Tanwar claimed that the mass organisations had a membership of about 1.75 lakh. 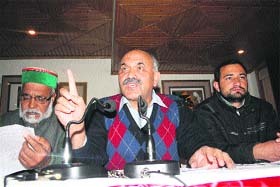 Blaming the neo-liberal policies being pursued since 1991 for the indiscriminate privatisation, jobless growth and blatant violation of labour laws, he said mere change of political parties at the helm and leadership would not help as the two main ruling alliances, the UPA and the NDA, had been “treading the same path” as far as economic policies were concerned. There was an urgent need to change the disastrous policies, which could be achieved only by building a strong public opinion against these policies, he said. He claimed that two decades of economic liberalisation had increased the number of landless persons by 22 per cent and over 3 lakh farmers had committed suicide across the country. Jobs were shrinking as the government was privatising its functions through outsourcing, he alleged. The main public sector undertaking providing service to the people like the state power board and the state road transport corporation were in a bad shape and their working was being affected due to the shortage of staff, he claimed. He questioned the authenticity of the latest monkey census and said the number of simians had increased significantly and not declined as claimed by the Forest Department. A mass sterilisation programme to contain the population of monkeys had been a miserable failure. The move to plant fruit plants in forest and set up a primate park for simians was not a practical solution, he added. Besides highlighting the problem like price rise, unemployment and corruption, the rally will also seek minimum wages for mid-day meal workers and anganwadi workers, 200 days work under MGNREGA in a year, withdrawal of RUSA, filling of all vacant posts in government departments and a halt to privatisation of education. An outlay of Rs 138 crore has been made for minor irrigation projects during 2013-14 with a target to cover around 3,000 hectares. Besides, 1,500 hectare land will be covered under major and medium irrigation projects. An official spokesman said the Shahnahar irrigation project and the Sidhata medium project in Kangra would be completed this year. A provision of Rs 55 crore had been made for the Phina Singh medium irrigation project in Nurpur while Rs 35 crore would be spent on Nadaun medium irrigation project. Directions had been issued to prepare a detailed project report for the construction of Salli to Darni Rirkumar Hathor kuhl in Kangra for irrigation purposes. The channelisation of the Beas would be carried out on priority for which study was being conducted. The Detailed Project Report (DPR) for channelisation of Chhonchh Khad in Indora worth Rs 179.59 crore had been approved by the Advisory Committee, Union Ministry of Water Resources. It would help bring 1740.30 hectare under irrigation. Work on stabilisation of Seer Khad from Jahu to Bum and channelisation of tributaries of the Bata river (Sunker) in Sirmour was in progress. Work on the Rs 922.49 crore project for channelisation of all streams of the Swan from Santokhgarh bridge to Daulatpur bridge had started recently. The project would benefit a population of 2,35,834 of 165 village and 7163.40 hectare barren land would be reclaimed. As per the latest census, over 90 per cent population of the state had been provided drinking water and out of 53,201 habitations, 44,254 habitations had been covered by providing 70 litres per capita per day of water. Efforts were being made to cover additional 2,500 habitations during 2013-14. As many as 2,000 hand pumps were being installed in water scarcity areas and the government is committed to providing potable water facility to all habitations by 2017. In a statement here today, the association alleged that the health services in the state would be hampered in the hands of inexperienced BDS doctors. It demanded that the BDS doctors should be withdrawn immediately as consultants and sent to periphery to serve people and senior experienced medical officers should be posted as NRHM consultants. Members of the association also urged the Chief Minister to reverse the decision of the previous BJP regime to increase the retirement age of teachers in medical colleges from 58 to 62 years as it had blocked the promotion avenues for young doctors who were being forced to leave the state and join medical colleges in other states. It demanded that regular departmental promotion committee (DPC) should be held for the posts of Director and Joint Director of Health Services, Chief Medical Officers, Deputy Directors and Block Medical Officers as most of the posts were vacant for the last one year. It demanded that postgraduation seats for regular medical officers, which were reduced to 66 per cent from 90 per cent, should be increased to at least 75 to 80 per cent. The association demanded grant of four-tier pay scale to all the medical officers and counting ad hoc, contract and RKS service for the release of 4-9-14 years time scale. The incident happened when a police team from Nalagarh was patrolling the area and intercepted three trucks carrying quarry material. On being told that mining was banned after 8 pm and they could not transport quarry material outside the state, the truck drivers deserted the vehicles and went away. 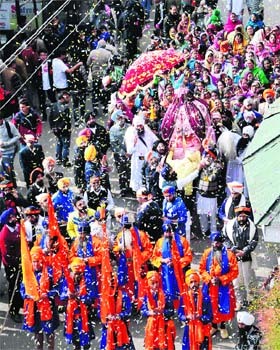 Later, Laddi, who hails from Punjab, returned with more than six persons. The men not only managed to drive away their vehicles but also pushed the policemen, who were trying to stop them. Despite the police alerting the staff deputed at various entry points, the trucks could not be nabbed. Nalagarh Deputy Superintendent of the Police (DSP) Nishchint Negi said since one person had been identified, they would manage to trace the others. A case under Sections 353, 506 and 34 of the IPC has been registered. Since the state government has banned transportation of quarry material outside the state and also plying of vehicles carrying such material from 8 pm to 8 am, the mining mafia is now operating at odd hours to escape police action. Despite strict directions, mining appears to be thriving in the belt. In a communication to The Tribune, state convener, IESM, Brig Khushal Thakur said the welfare of ex-servicemen was the responsibility of both the Centre and the state. The sainik welfare boards had become dysfunctional and politicians and bureaucrats had no time to address the problems of soldiers and ex-servicemen, he resented. He further said there was time when the commander used to refer the problems to the district civil administration. The grievances were addressed promptly, but today no such mechanism existed. He urged the government to reconstitute the Zila Sainik Board in all 12 districts as there was no Zila Sainik Welfare Officer and staff in eight districts. Brigadier Thakur said the Sainik Welfare Department must establish and maintain a close liaison with the Western Command HQ, Chandimandir, and Army HQ Training Command, Shimla. These headquarters contribute to welfare of serving and ex-servicemen through monetary help, CSD canteens, ECHS clinics mainly in non-military stations. The issue of the formation of the new BCC is now under the consideration of HPCC president Sukhwinder Singh Sukhu. The appointment of Hamirpur BCC president owns much significance since Hamirpur is the home district of former Chief Minister PK Dhumal and is considered a stronghold of the BJP. More so, since Dhumal is representing the Hamirpur seat in the state Assembly and politics here is dominated by him. The Hamirpur BCC, headed by Jugal Kishor, was under the scanner of HPCC leaders as there were reports that the BCC was not functioning properly due to poor attendance in the meeting. The dissolution of the BCC had become imminent after a report submitted by BCC observer ID Lakhanpal on its functioning. The BCC leaderships were also not maintaining good relations with the HPCC leadership. Since the Congress leadership is laying special emphasis on the Hamirpur parliamentary seat for the next elections, the HPCC is looking for a mature person to head the Hamirpur BCC to take on the well entrenched BJP in Hamirpur. The HPCC president’s role in the appointment of the BCC president will be quite crucial as he also hails from Hamirpur district and will like to have his own man on this post. Naresh Thakur, DCC president, said, “The appointment of the BCC president is under the consideration of the Congress leadership and the BCC will be constituted with the approval from the HPCC president”. Dr Francis Buner, a senior conservation scientist from the Game and Wildlife Conservation Trust, UK, and TH Walker, a bird ringer and trainer from the British Trust of Ornithology (BTO), imparted two weeks training to the wildlife staff in bird identification skills and ringing of birds. In all, 23 wildlife guards and three range officers underwent the training. A total of 57 bird species were identified and more than 260 individual birds of various species were ringed with metallic rings having unique number and Bombay Natural History Society (BNHS) stamp. These rings have been provided by the Bombay Natural History Society of India. “The main objective behind establishing the first bird ringing station in the Western Himalayas was that it acts as a blueprint for further stations required to be set up to study bird migration between the Indian subcontinent and Central Asia and provide wildlife staff with the necessary basic bird identification skills needed to carry out surveys,” said Tarun Sridhar, Principal Secretary, Forests and Revenue. He said another objective was to have a ringing scheme similar to the one used in Europe and North America which, over its almost 100 years of existence, had provided an exciting and important ecological data which had resulted in countless conservation projects along migratory routes and wintering sites of birds. He said the camp was organised to give basic knowledge of karate to the girls and they were taught the self-defence technique during the camp. He said selected girls from Class VI to XII were given the training as it was the need of the hour in present times. The training was given by a penal of Black Belts from the Academy of Martial Arts being run by the Jun Do Kan Go Ju Ryu Karate Federation of India, which has its headquarters in the state. The Academy of Martial Arts was started at Mahadev village in 1991 and since then it has been imparting traditional karate training to various organisations. The girls who took the training said they enjoyed the training as it infused self-confidence in them to deal with any situation. They urged the school authorities to hold such camps in future as well. In a letter addressed to all Chief Medical Officers and Senior Medical Officers , Kaul Singh has directed them to implement the order of the state government with immediate effect and no doctor prescribes branded drugs which are very costly and beyond the reach of poor patients. The minister said the Government of India had already reduced the MRP of 341 drugs to half of their earlier prices, therefore, doctors should only prescribe cheaper drugs. Two cases of sexual assault have been reported in Hamirpur district. In a case registered under Badsar police station, a minor was allegedly raped by her minor cousin. As per police information, the victim had gone to bring back her younger brother who was watching a TV programme at her cousin's house and was allegedly sexually assaulted by her minor cousin there on October 20. The police has registered a case under Section 376 of the IPC and also under the Prevention of a Child from Sexual Offences (POCSO). In another incident, a girl of a local degree college was sexually assaulted by her college mate in a rented room of her friend, near the local college, yesterday. They passed a resolution regarding this at a meeting of the unit at the Bharaadi rest house, near Ghumarwin, yesterday. The meeting was presided by unit president Raksha Kapil and addressed by morcha state vice-president Usha Thakur. National Training Wing member Rajender Garga, who was also present at the meeting, alleged that while the Central government had failed to control the ever-rising prices of essentials, the state government had failed to keep proper supplies in government ration depots. The meeting alleged that no proper employment projects were launched by the Central government. Those who were present at the meeting included Anisha Sharma, Gayatri Sharma, Neena Thakur, Pooja, Gayatri Devi, Amriti Devi, Sanjay Kanta, Asha Thakur, Arti Devi, Phoolan Devi, Shakuntala Devi and Suman and BJP general secretaries Zorawar Singh, Navin Kumar and Yuva Morcha president Chaman Sharma. The 800 MW power project, which is going to be completed soon, has displaced several hundred families of this district. Plot allotment letters were handed over to the oustees by Additional District Magistrate Pradeep Kumar in the presence of several NTPC officers. All these families were also given one-time rehabilitation grant of Rs 60,000. They were also urged to start construction of their houses on these plots at the earliest. Project Public Relations Officer Pravin Ranjan Bharti said efforts were being made to settle all problems of the oustees. The report revealed that the four injured, including driver Manoj Kumar, had been brought to the Civil Hospital, Chamba, where they were undergoing treatment. A case of rash and negligent driving had been registered against Manoj Kumar at the Chamba police station, the report further said.